I have represented injured workers in the Texas workers’ compensation system for over 20 years now. I’ve seen a little bit of everything that can possibly happen to someone fighting to establish a workers’ comp claim. The workers’ comp system in Texas is stacked against injured workers. All of the equities built into the new system back in 1990 have slowly been taken away. Insurance companies have been given all of the power to deny claims with little or no penalty for screwing people over. These big insurance companies have adopted a strategy of denying everything just because they can. And because the workers’ comp dispute resolution system has made it so difficult for injured workers to win, the strategy of denying as much as they can is paying off for insurance companies. Because injured workers are at such a disadvantage in Texas, I wrote a book with my friend Daniel Morris in an attempt to educate people about their rights when they get hurt on the job, the process to pursue dispute resolution and overturn claim denials, and tips that will help people to have a fighting chance. It’s a how-to book for Texas injured workers only. Click here to get your FREE copy of my book! If you’ve been injured on the job, then you know there is a whole new language you have to learn in order to understand workers’ comp. Our book breaks it all down for you and should give you the information you need to give yourself the best chance to win. This book addresses how to file a claim, how to establish your injuries, causation, disability, temporary income benefits, bona fide offers of employment, maximum medical improvement, impairment ratings, preauthorization, appeals and so much more. The best part – the book is FREE and available as a pdf download. Get yours right now. 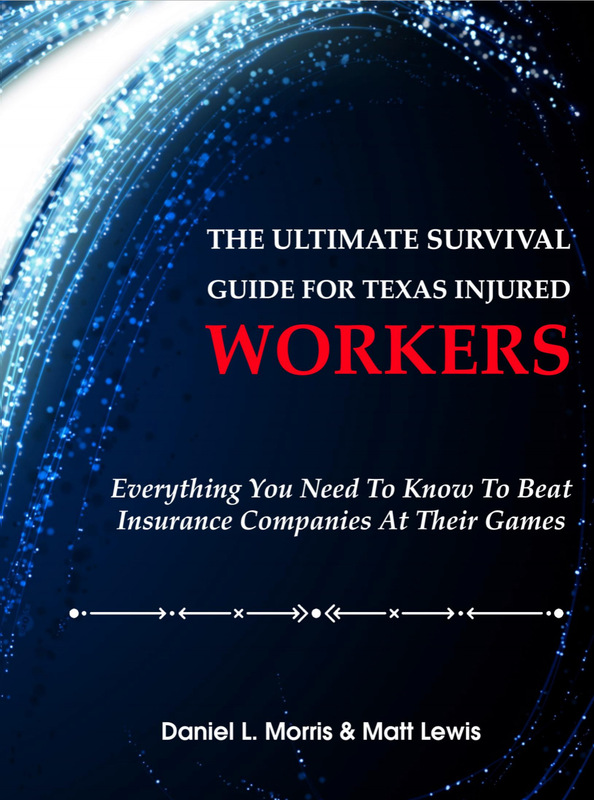 Click here to get your FREE download of The Ultimate Survival Guide For Texas Injured Workers. This book is a how-to guide for the Texas workers’ comp system. Don’t pass it up, it’s FREE!